A friend of mine, who doesn't care for soca, nevertheless once described it, accurately enough, as "calypso with 40,000 volts put through it." Soca tends to be more party-hearty than the older music (no criticism implied or intended - Hot Hot Hot is one of the all time great get-down tunes), but among the virtues it inherits from kaiso are verbal ingenuity, topical satire, and great pseudonyms - Black Stalin, Scrunter, Mighty Grynner, and the unfeasibly surreal Red Plastic Bag among them. So when the editor asked if I wanted to review a CD by Alexander D Great, Emperor of Socablues, I said, "How can I turn down someone with a name like that?" Well - we live and learn. Forty eight year old David Alexander Loewenthal is of mixed German and Trinidadian parentage and, though Trinidad born, is British by upbringing. He performs live with the eight piece Great Band (pan, percussion horns, guitar and bass), but on this disc, apart from the addition of a pan player on one track, he is self-accompanied on a £19.99 child's guitar. As Alexander rightly says, this sounds rather like a cuatro, but the extra strings enable him to play the more advanced chords that come easily to someone with a degree in music, and playing experience in numerous genres. Despite singing in a Trinidadian accent - necessarily, since calypso with an English accent just doesn't sound right - his topics on this CD are aspects of the black experience in Britain since the Empire Windrush arrived in 1948. 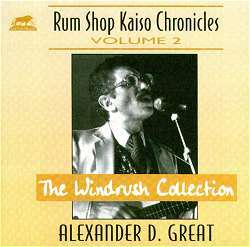 That's obviously an area of life and history with the potential to be quarried for song making, and the 12 tunes here are among those which Alexander has composed weekly for the Caribbean Affair show on Choice FM. There are two problems with this collection, unfortunately: the words and the music. Despite Alexander's command of his instrument, and some unusual key changes, the sound of just his voice and the baby guitar' is too minimalist and unadorned to sustain attention. There is also a shortage of strong, catchy melodies. Save on Unzip a Banana, his tunes are mostly somewhat meandering constructions, with very long refrains, which become tedious through repetition, and lead one to feel that Alexander's musical creativity is somewhat short winded. It's something of a relief to turn to Roosevelt in Trinidad, if only because of the greater musical variety inevitably offered by an anthology, notwithstanding that 15 titles out of 25 are accompanied by Gerald Clark and his Caribbean Serenaders. These 15 were all recorded in New York, whither the more popular calypsonians travelled annually from 1934 onwards. At first sight, it seems remarkable that the record companies saw the funding of these trips and sessions as a commercial proposition in the Depression years, but no doubt there was sales potential among the Trinidadian, and other Afro-Caribbean, communities in the United States, as well as in the islands themselves. It was, of course, a very different world that provided the context for calypsonian commentary in the thirties, as The Lion's King George the VI (aka Three Cheers for the Red White and Blue) should make clear (sound clip). It doesn't need stressing, of course, that colonial peoples' loyalty to the British Empire wasn't exactly reciprocated, even when Lion was recording his song. After the Second World War, the Empire was simply too expensive for a near-bankrupt Britain to sustain, and Roosevelt, eulogised in the CD's title track, thereby achieved one of his secondary war aims, although it was a long time happening. Those who made the move to the mother country' soon found, as Alexander D Great points out, that they were regarded as immigrants rather than British citizens. And wonder if it's a one-sided report. 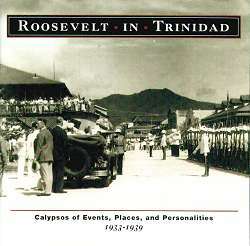 But if Roosevelt in Trinidad is to that extent itself a one-sided report,' it's still excellent listening. Rounder deserve a special commendation for bravery, for including three songs dealing with a subject that is surely commercial death in the American market - cricket. (If the royal family were well regarded, cricket was more akin to a religion; I got the morning off school for that royal wedding film, but three days when MCC played Berbice.) John Cowley's footnoting of these songs for an audience that couldn't care less about leather and willow is truly heroic, although it could have been noted that the West Indies' captain, Mister Grant' is so identified as both an amateur and - what the captain had to be in those days - a white man. Perhaps as a counterweight to matters that are beyond a boundary for many listeners, there are also testaments to Trinidad's fascination with the culture of the United States, both on screen and record: The Lion praises the Four Mills Brothers and Bing Crosby, who has a queer eccentricity, He takes his hat off very infrequently, while Tiger catalogues his favourite Movie Stars. As this clip demonstrates, it doesn't all go Hollywood's way; can there be another song that boosts Wheeler and Woolsey alongside Laurel and Hardy - or indeed at all? (sound clip). Then, too, there are the songs that deal with events of more local interest - some tragic, like the Trinidad Hurricane, some treated tragicomically, like the Treasury Fire in which 365,000 gallons of bonded alcohol were consumed by the flames (sound clip), and some of them nine days' wonders, like Black Prince's tale of the School Boys' Adventure, when seven lads who rowed out from Carenage to see the arrival of the luxury liner Normandie found themselves carried to Venezuela by the current instead. The contents of Roosevelt in Trinidad were recorded in just seven years, and I'm reminded of John Storm Robert's observation (à propos the musically very different calypsos of Sierra Leone) that these songs function as an oral daily newspaper, complete with editorial and gossip columns. The News of the World used to proclaim on its masthead that 'All human life is there.' That wasn't true of the News of the World (very little about existentialism or jazz discography), nor is it of calypso (no dirty vicars, although the sedition laws were passed as a result of King Radio writing a song about an adulterous liaison among the white upper classes.) It's true in spirit though, and seldom can current events have been the source of such musical pleasure as they were and are on the 78s that now comprise this CD.